Compathos shares stories that inspire action towards positive and compassionate global change. Our mission is to educate and encourage by producing award-winning films, student media expeditions, immersive / interactive media and events such as the Film with Social Impact Director Series and RELEVATE Films Forum. Compathos supports the work of social change agents through fiscal sponsorship and provides strategic insight for a host of artists, filmmakers, and entrepreneurial movement-makers who are creating positive world change through media impact. We design innovative programs to harness today's rapid shifts in technology. We employ immersive storytelling to best serve our diverse creative network. We are passionate about creating inspiring campaigns with measurable impacts. For nearly a decade, Compathos has partnered with talented creative professionals who recognize the power of the arts, media and entertainment as a dynamic force for education, transformation and social good. Here you can explore a media-rich tapestry of ground-breaking films, videos, articles, podcasts and educational resources - all dedicated to imagining a better world. 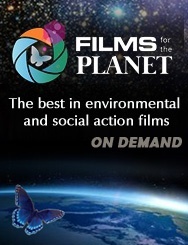 Discover our latest initiative, Films for the Planet, an online platform featuring the best in environmental and social impact films on-demand. Be part of the story and embark on a high stakes planetary adventure as we join together on a personal and collective quest for a thriving, generative future.